Easy Keto Desserts: 50 Keto Sweets and Treats for Weight Loss! When you think of a diet, the last thing that probably comes to mind is dessert. If you’re trying to lose weight, you’re often told to stay miles away from sweets and treats. But when it comes to the keto diet, easy keto desserts are part of a balanced daily regimen. Well maybe not every single day, but at least on the weekends. Keto diet meals are low carb and high in fat, which actually makes for perfect keto sweets and keto treats. When you eat foods that are high in carbs, your body produces glucose and insulin, and with a high carb diet, your body uses glucose as energy. But with the keto diet, your body produces ketones in the liver to be used as energy instead. By lowering the intake of carbs with keto diet recipes your body is induced into ketosis, which offers plenty of benefits including weight loss, enhanced physical and mental performance, increased energy, and blood sugar control, to name a few. Pssst. Are you looking for SIMPLE weight loss? Click HERE to get keto-approved meals plans sent straight to your inbox. The best keto desserts are as healthy as they are delicious! They’re bite-sized and perfect to munch on after a healthy keto meal. I don’t know about you, but I never have time to make a huge, extravagant dessert unless it’s a special occasion. These sweet keto recipes only have a few ingredients so you can whip them up in no time! You work hard all week. You hit the gym and eat healthy keto meals, but you’re also allowed to indulge from time to time. Especially when the desserts are keto certified! Would you believe you get to eat everything from brownies to peanut butter bark and cheesecake on the keto diet? 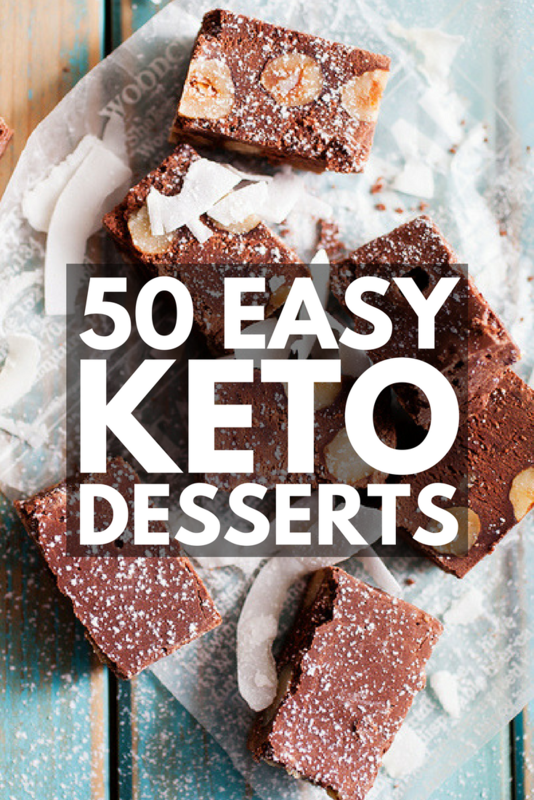 Get your ketogenic cooking on and try these 50 keto dessert recipes you’re sure to love! If you’re on the keto diet, don’t forget about yummy keto desserts! These quick and easy recipes are perfect to whip up when you have a sweet tooth, but still want to be healthy! If you liked this collection of easy keto desserts, please share this post on Pinterest! And if you’re looking for more keto diet recipes, please follow our Health board on Pinterest! Kate is a freelance writer with a background in fashion, beauty and wellness. When she’s not trying out new recipes, taking a hot yoga class, or curled up with a good book, you can find her blogging about lifestyle tips and entrepreneurialism at Layered Indulgence.